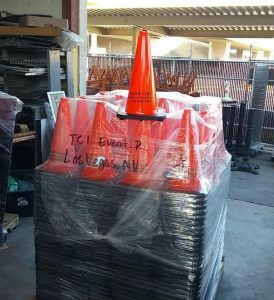 Boulevard Supply is a dealer of bulk traffic cones to road construction companies, municipalities, airports, commercial businesses, schools and the public. We offer wholesale pricing on bulk purchases of JBC Revolution Series, DOT approved traffic cones. Minimum orders apply to receive free shipping. Please call if you need a quote on traffic cones not seen on our website. Here is a great example of why buying in bulk makes sense. We understand not everyone needs dozens or hundreds of traffic cones but when you have the budget, it just makes sense! Quantities and prices used are for example only. Each order is quoted individually. Please contact us with quantity, destination and the details of the type of traffic cones you need. Traffic cones are shipped by the pallet load so you will need a forklift or loading dock. If you do not have these available at your facility, please let us know so we can add lift gate service to your bulk order. 50% down payment required on traffic cone purchases over $2500.